This is a great Quartz point. At some time in its life a cluster of tiny, creamy coloured, Quartz points formed over the base of this piece. From this cluster a couple of tiny clear Quartz points grew slightly larger than their brothers and sisters and can be seen at the top of the creamy cluster today. All this of course is added interest to a point which is very clear and which has lots of etchings and markings on its body. The actual point is very nicely formed and comes to quite a sharp tip. There is also a teeny weeny rainbow in the centre of this piece. Quartz, sometimes called clear quartz or rock crystal or quartz crystal, is a Master Healer, and as such, can be used for any condition. 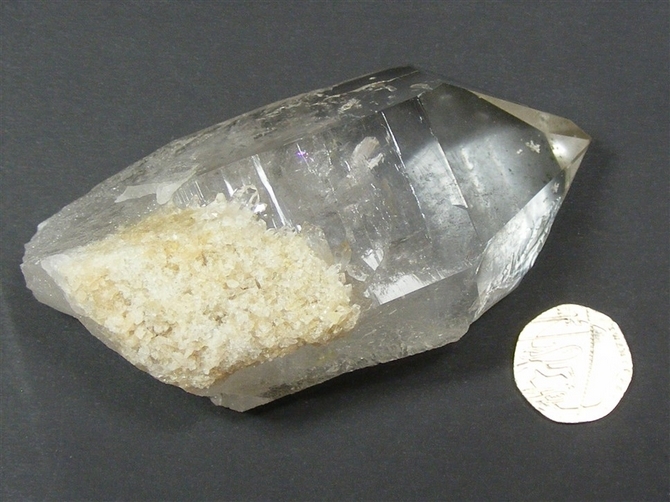 Quartz has the property to receive, store, amplify and transmit energies. It has an organising and harmonising effect on all parts of the body. When Quartz is attuned to the person requiring healing, it can act at a very deep vibrational level indeed, bringing the body, the subtle bodies and the aura back into balance. 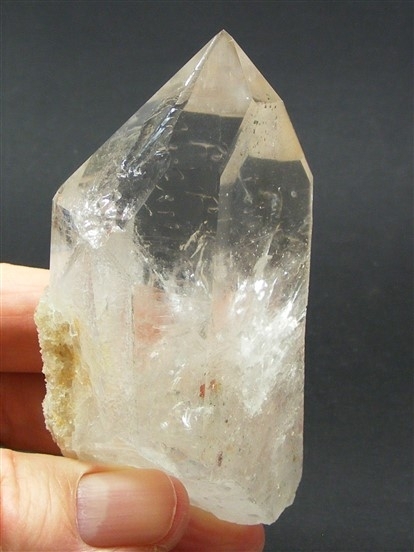 Quartz is excellent for general healing as it helps to speed up the whole healing process. It fortifies the nerves, balances the two halves of the brain and stimulates glandular activity. Quartz can also amplify the effect of other crystals placed nearby. Quartz dissolves areas of imbalance and negativity and provides us with a sense of calmness and clarity in our minds. 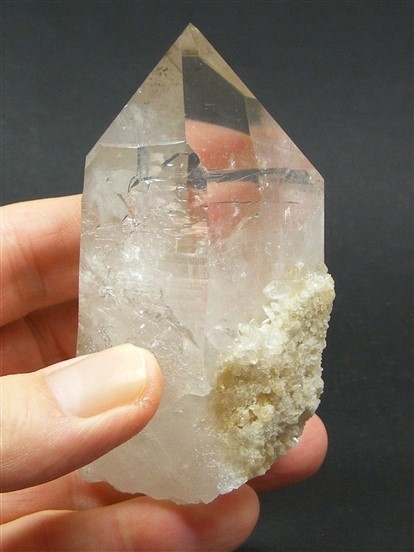 It restores a more balanced energy to us and this property makes Quartz a valuable healing tool. 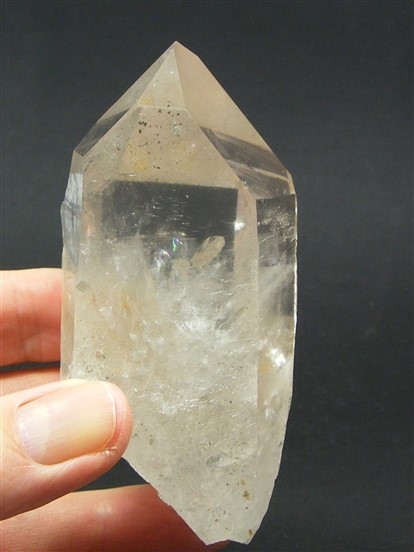 Quartz amplifies and strengthens the whole auric field. It helps us to find simple ways to solve our problems, aids concentration and helps us to remember things. Quartz harmonises all the chakras. An excellent stone for meditation, Quartz enables us to communicate with all levels of spirit life and indeed, with every dimension. 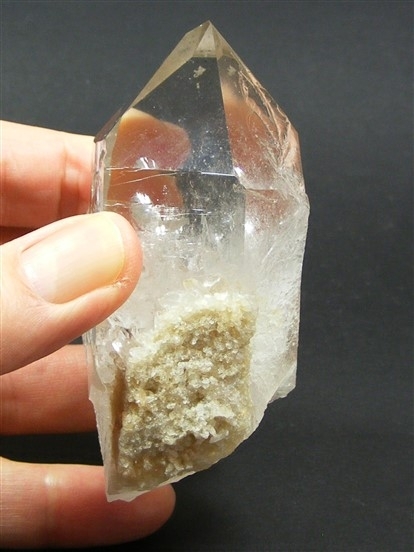 Quartz can encourage our spiritual development and can also help us to attune to our spiritual purpose in life. Quartz further helps us by ensuring that any such spiritual development remains in tune with our own sense of who we are, in tune with our own sense of our true inner self. It is a deep soul cleanser, raising energies to their highest possible spiritual level.